DENVER, CO / ACCESSWIRE / January 30, 2019 / New Age Beverages Corporation (NASDAQ: NBEV), the Colorado and Utah-based company intending to become the world's leading healthy beverage and liefstyles company, today announced the global expansion of its Noni+Collagen product, following achievement of over $4 million in revenue in its first two months in initial test markets. New Age's Morinda Division created the Noni+Collagen product, and is offering the brand in 50 ml glass bottle shots, positioned as a once-daily use, sold in three 10-packs for a 30-day supply. The skin-healthy collagen supplement, built on a foundation of pure Tahitian Noni Juice, became Morinda's most successful launch in company history since the original launch of Tahitian Noni Juice more than 20 years ago. The products are only available through Morinda's DTC network or online at www.Morinda.com. ''Collagen is one of the major trends in beverages and is expected to play a significant role in the beverage landscape in 2019,'' according to BevSource Group, is a global beverage business consulting company. Google trends ''tracked an all-time high in consumer awareness and interest in collagen in 2018…with sales up 33.8%,'' according to SPINS. Noni+Collagen combines hydrolyzed marine collagen that is naturally and sustainably sourced, with pure authentic Tahitian Noni fruit, and other natural ingredients to help stimulate collagen production and produce firmer, younger-looking skin with fewer wrinkles and increased elasticity. 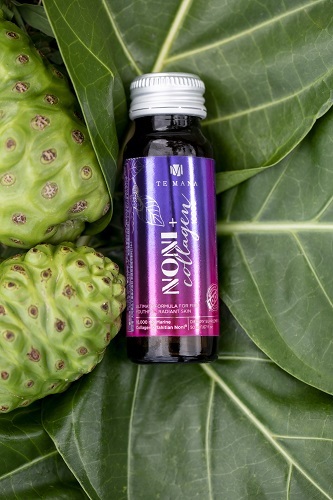 Launched under Morinda's TeMana beauty line, the product demonstrates the company's ability to innovate on the core Noni business, and leverage the benefits and brand equity of Tahitian Noni Juice to enter new consumer segments. This press release contains forward-looking statements that are made pursuant to the safe harbor provisions within the meaning of Section 27A of the Securities Act of 1933, as amended, and Section 21E of the Securities Exchange Act of 1934, as amended. Forward-looking statements are any statements that express the current beliefs and expectations of management, including but not limited to statements related to the Company's upcoming market penetration. Any statements contained herein that do not describe historical facts are forward-looking statements that are subject to risks and uncertainties that could cause actual results, performance and achievements to differ materially from those discussed in such forward-looking statements. The Company cautions readers not to place undue reliance on any forward-looking statements, which speak only as of the date they were made. The Company undertakes no obligation to update or revise forward-looking statements, except as otherwise required by law, whether as a result of new information, future events or otherwise.